Don’t just innovate how you measure marketing. Innovate how you market. Keen is a first-of-its-kind solution that accurately calculates financial contribution across all your marketing channels (digital, traditional and trade) to introduce a truly unified marketing measurement platform. 1. Short-Term Revenue – Models the most efficient mix and timing to achieve a specific revenue target for an investment. 2. Long-Term Profitability – Quantifies long- and short-term impacts of each tactic to project the marketing mix and investment that maximizes net present value (NPV). 3. Budget – Optimizes plan tactics and timing against a fixed level of investment. Today’s marketers are either bogged down in big data or relying on gut instinct. Keen uses the right data to create accurate, actionable insights using recent data. Our solution is built on a normative market database over which we layer your brand’s marketing and financial data, and/or data from your marketing mix service. Machine learning continuously improves precision with time and experience. Yet none of these metrics reliably correlates to sales revenue. Keen’s algorithms take disparate metrics and levels of granularity and create a level playing field by calculating inferred contribution for each channel, as well as associated risk — a powerful, precise framework for modeling future investment decisions. Model the weekly revenue contribution by channel for all future years, relative to the investment amount — a number literally derived from hundreds of calculations. 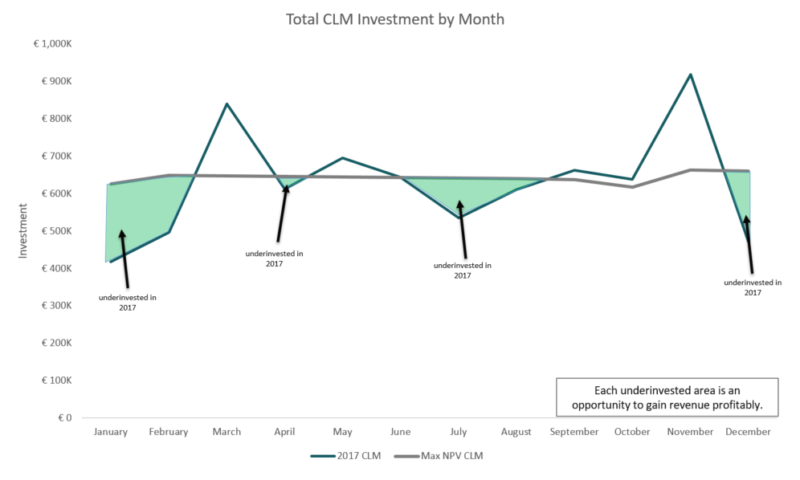 This forward-focus lets you quickly pinpoint the optimal weekly spends, and identify where you’re over-invested and where you have opportunity to increase spending for a greater return, an especially powerful capability for seasonal products and programs. Generate updates in response to changes to your marketplace — competitive activity, distribution changes, even weather disruptions — and course correct to stay on target (or uncover new opportunities to gain ground). When marketers talk about ROI they typically mean a calculation of short-term return over a 12-16 week window. The unintended result is to drive a short-term focus in marketing that values immediate return over longer-term equity building, and where meeting or barely surpassing last year is good enough. Keen uses a different approach known as marginal ROI, which uses response curves to predict a channel’s return out over six years to more accurately reflect the value (and correct balance between) short-term and long-term programs. Marginal ROI indicates how much to spend (or not) for a given channel each week and accounts for other marketing spending in that week (interrelationship) as well as the effect of external market factors. Because Keen accurately correlates marketing investments to financial impact, your plans will deliver better results, with greater predictability. Now you’ll be speaking the language your CFO longs to hear.